We were recently asked why our new communal area / training room is built using conventional building techniques. If I’m honest it’s simply because it was quick and easy, the materials were easily available and will fit in with the existing house. But Jeroen is very excited to be soon attending a Straw Bale Building course close by in Paul. We’re already knocking around some new ideas. 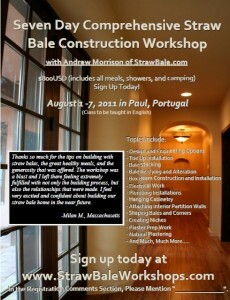 The course is being run by Andrew Morrison of www.strawbale.com, his first course in Europe. If you can make it, make sure you tell Andrew that you heard about it from Jeroen at Casalinho. If you can’t make the course, sign up for his free 7 day e-course ‘7 Essential Steps to Straw Bale Success’ which you’ll find on the site. 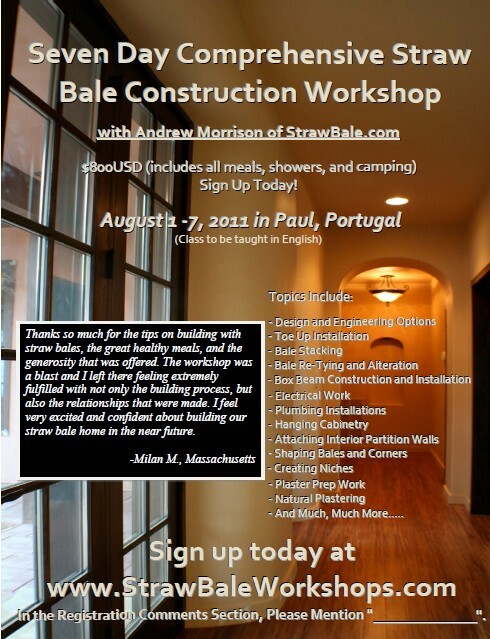 To take your course on making a “straw bale” addition on to our home. Can you p!ease let us know if we can still take this course. We’re not running a straw bale course here this year. I suggest you take a look at http://www.strawbale.com, which is Andrew Morrison’s site where he offers a free e-course. You may also wish to keep an eye on http://www.ecolivingportugal.org where you’re likely to find such events in Portugal listed.